Whether you’re a frequent flyer who travels with a ton of tech, or a student headed back to school, Speck’s new line of backpacks has the right bag for every need. From the premium Laptop Business Backpack to the lightweight yet durable Velocity, each bag can fit a laptop with plenty of extra space for tablets, e-readers, cameras, cables, notebooks, and more. Our protective Laptop Business Backpack has shock-absorbing Viz Air bumpers filled with air that cushion your 15-inch laptop and protect it when you set down the bag. This premium backpack is made with business travelers in mind and has three spacious compartments that can fit tablets, headphones, and other tech accessories. The large padded laptop compartment zips open flat so you can get through airport security without taking your computer out of the bag. The Laptop Business Messenger Bag is a water-resistant bag with ample space for up to a 17-inch laptop. What makes the bag special is the convertible SmartSleeve, which zips open to slide over the handle of a rolling suitcase, or zips close to create an extra pocket. 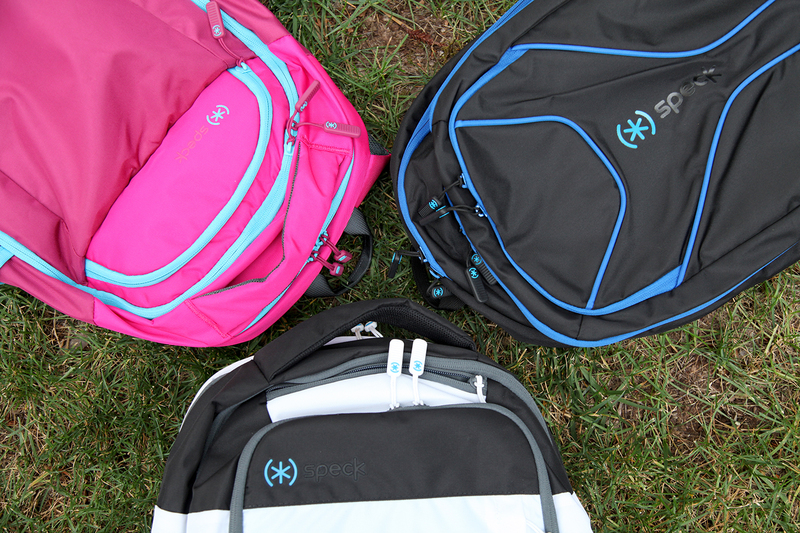 For back to school, we have four backpacks for students of all ages. Gear enthusiasts will love Kargo (above), which protects most 17-inch laptops with room for cameras, tablets, e-readers, and cables. The soft fabric-lined front pocket protects headphones, phones, sunglasses, and other fragile items from scratches. This laptop backpack is TSA-friendly and unzips completely flat so you don’t have to remove your laptop when going through airport security. The durable Deck laptop backpack holds up to a 15-inch laptop and has a soft fabric-lined sleeve for a tablet. Pass-through ports inside the backpack allow you charge something in one compartment while your battery pack is in another. Lightweight and spacious, our Stingray backpack holds up to a 15-inch laptop and has two main compartments for binders, books, lunches and more. The two elastic side pockets allow for quick access to a water bottle or anything else you need at your fingertips. For lighter travels, Velocity can carry up to a 15-inch laptop, with extra space for notebooks, binders, books and other school supplies. The front quick-access pocket is perfect for stashing cables, pens, and keys, while an interior pocket has two pouches for other accessories small items.